Photo: Washington Metropolitan Area Transit Authority. A project to reduce water infiltration in deep segments of the Washington Metro’s Red line has been expanded. An initial pilot began in July, 2017, with contractors installing a new waterproof membrane on sections of the Red line. These were built before the widespread use of the New Austrian Tunnelling method – which provides a tunnel with a waterproof membrane – go below water level and are prone to leak. The pilot involved using a “curtain grouting” technique that requires drilling hundreds of holes through the tunnel ceiling and injecting a polymer-based material through the holes to form a protective layer on the exterior of the tunnel walls. 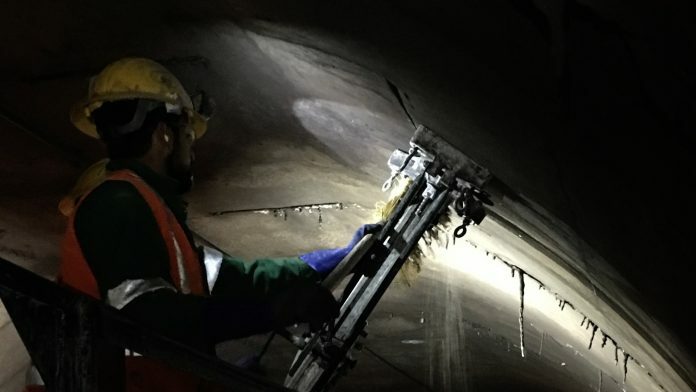 After being initially expanded in October, further improvements have led to the waterproofing pilot to be expanded once more to mitigate leaks and improve service reliability. As a result of the pilot, a number of evening and weekend services are due to be impacted on the Washington Metro’s Red line until February.